Jupiter is the only planet visible in the east in the early morning, very easy to spot, being the brightest object in that part of the sky. Jupiter will become brighter and brighter as the year advances, reaching its greatest brilliance in its whole 11.8 years cycle just in time for the Libra Equinox 2010 (September 21).This is due to the fact that Jupiter will reach its perihelion, closest position in relation to the Sun, in March 2011. The giant planet has nearly finished its swift transit through the Sign of Pisces, leaving it on June 6. Jupiter will return to Pisces later in the year (September 9), until January 2011. The passage of Jupiter over your own Sun Sign (or Moon, Ascendant Sign), should bring a desire to improve your circumstances, also a better feeling about yourself and your prospects. Through Jupiter we can have a more clear and promising visions of our potential, and a more positive outlook on life in general (see Jupiter in Pisces post). On May 9 Jupiter will shine close south of the waning Moon in Pisces (see a picture of this conjunction in May’s Observable Events, below). Every morning then, during this Jupiter Morning Star’s period we could all look up into this bright disk and ‘see’ ourselves evolving and living brighter, more fulfilling lives. This exercise could prove especially rewarding for the Water Signs (Cancer, Scorpio, Pisces) and the Earth Signs (Taurus, Virgo, Capricorn). The Evening Star’s incarnation of Venus represents a collective opportunity to become more self-reflective, acknowledging our contribution to any relationship issues we may be experiencing. The Goddess of Love is looking deeper into our hearts and show us the way to a less self-centred and more aware kind of loving, (see also Venus in Gemini post). 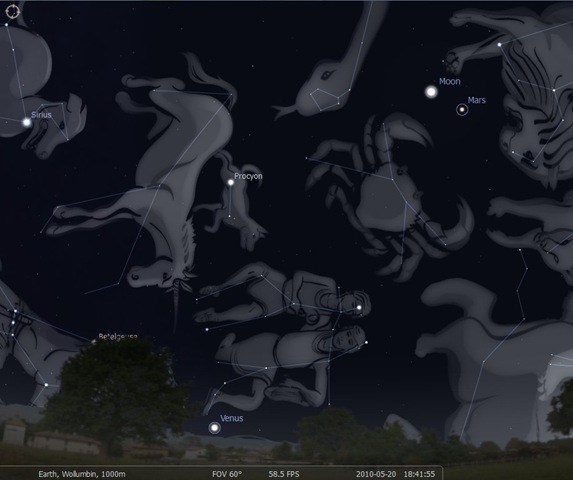 At the start of the month of May, Venus will be on dark close to the Hyades cluster of the Taurus Constellation, not far north of Aldebaran, the alpha star of the same. Venus will be easy to spot throughout the month, in the North-East from early evening, say 5 to 5.30 pm, if you have a clear, flat horizon, setting around 6.30 pm. An important astronomical event is be falling Venus on May 16, an occultation (planetary eclipse) by the Moon, the first this year. Unfortunately the event will occur during day-light hours in Australia, while it will be observable from Thailand and Indonesia. 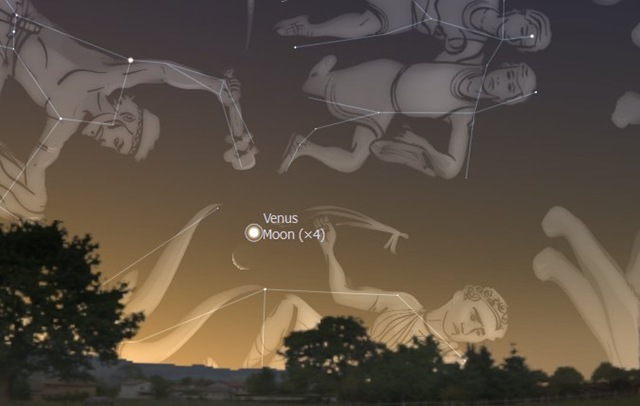 The next occultations of Venus by the Moon will happen on September 11 and November 5 this year; the latter event will be observable from Western Australia. In May Retrograde Mercury will be lost in the twilight (its latest Inferior Conjunction with the Sun having occurred on April 28), until it will re-appear as Morning Star, very faintly at first, on May 31. Mercury will turn Direct again on May 12. For the possible effects of the retro motion of Mercury in Taurus click here. 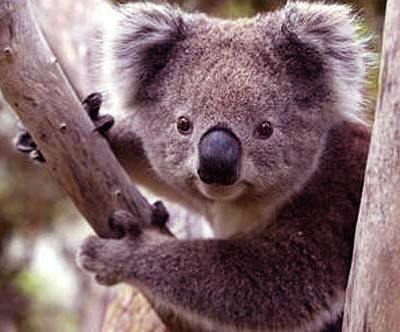 And for general information on the phenomenon of Retrogradation please check this Tutorial. Mars, still transiting the Tropical or Seasonal Sign of Leo, will be entering the Constellation of Leo in May, leaving behind the Cancer Beehive, beautiful Star Cluster in the Constellation of Cancer. 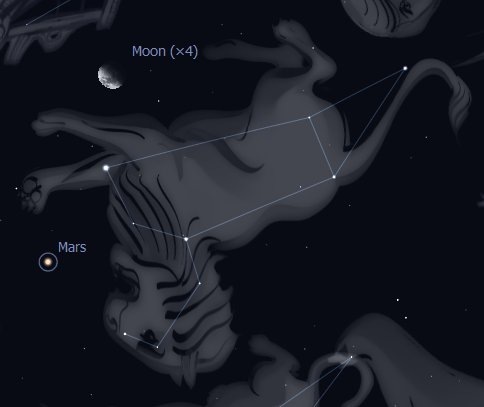 Mars’ light is diminishing this month. You can spot Mars in the evening in the North-West, low above the horizon, reddish in colour, forming two imaginary lines: the first with the Stars Sirius, the Big Dog in the Constellation of Canis Major, at the heels of hunter Orion, and Procyon, the Little Dog in the Constellation of Canis Mino; and the second with Regulus, alpha Star of Leo, Saturn and Spica, alpha Star of Virgo Constellation. On May 20 a conjunction of Mars to the waxing Crescent Moon will be observable in the North-West, after dark (see a picture of this conjunction in May’s Observable Events, below). Saturn will rise before sunset in May, and it will be easily visible between the Stars Regulus (Constellation Leo) and Spica (Constellation Virgo). 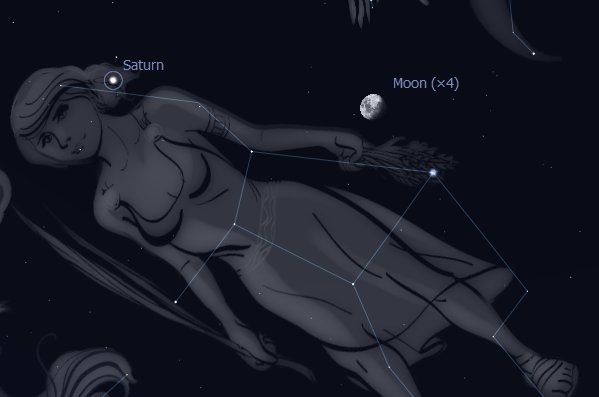 By around 10 pm Saturn will be high in the sky. Like Mars, Saturn also is becoming dimmer this month, moving away from the Earth at an angle that will cause its rings to become thinner, reflecting less sunlight. 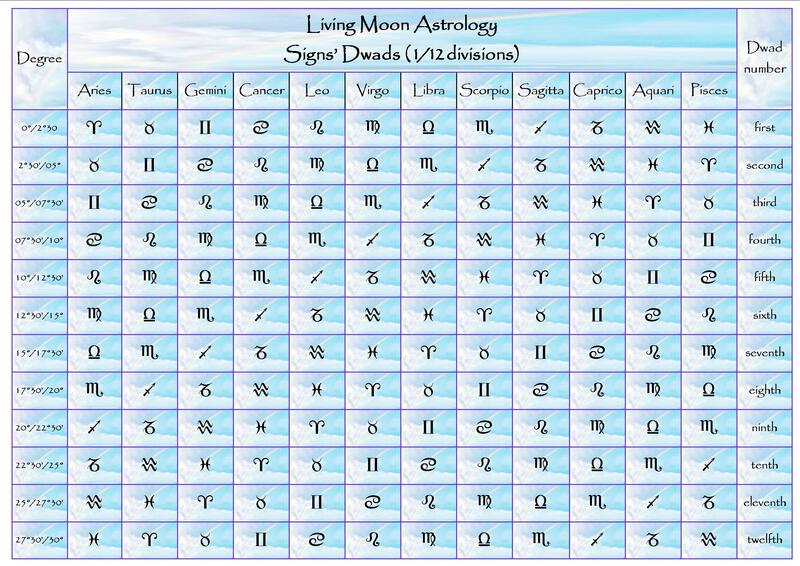 Saturn will transit Virgo in retrogradation from April 8, re-entering Libra only in July. For an in-depth reading of the major transits of Saturn and others, for the present and near future, please visit 2010 Forecast page. Around May 6 the Eta Aquarid Meteor Shower will reach its peak. Eta is a Star in Aquarius and it is against the backdrop of this Constellation that the shower takes place. These meteors are remnants of Halley’s Comet, deposited as a stream of debris during one of its passes close to our planet. Between May 1 and 8 you can look East, after sunset, to spot those meteors. They in fact start appearing well before the rising of the Constellation of Aquarius that occur after midnight. 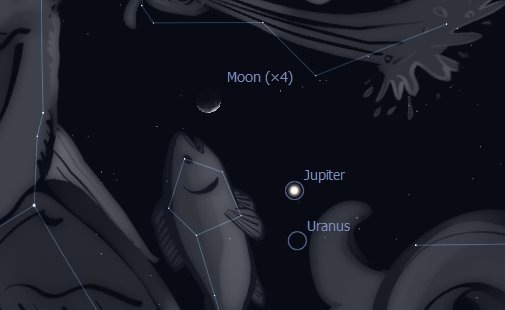 MAY 9: the waning Moon in the Tropical Sign of Pisces will be conjunct Jupiter, event visible in the early eastern sky before sunrise. Uranus will be there also, invisible unless you are looking through a powerful telescope. Below is a snapshot of this conjunction, looking toward the East around 5 am. MAY 16: the tiny Crescent Moon in the Sign of Gemini can be observed very close to Venus, in fact occulting Venus (but not for Australian and New Zealand’s viewers). Below is a snapshot of this conjunction, looking toward the North-West, after sunset. MAY 20: the waxing Crescent Moon will be visibly conjunct Mars, in the North-West after sunset. Below is a snapshot of this event. MAY 21: the First Quarter Moon, on the cusp Leo-Virgo, will be seen close to the Star Regulus, alpha of Leo Constellation. Mars will be in the picture too. Below is a snapshot of this event, looking toward the North-West, before 9 pm. 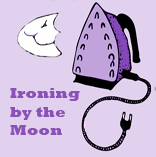 MAY 24: the waxing Gibbous Moon in Libra will be seen conjunct Spica, the alpha Star of Virgo Constellation. Below is a snapshot of this beautiful event, taken at around 6 pm, looking toward the East. Saturn is also in the picture. 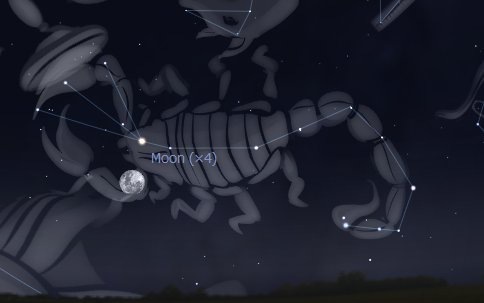 MAY 28: the Full Moon in Sagittarius (Tropical Sign) can be seen conjunct Antares, alpha Star of Scorpio Constellation. The snapshot below shows this conjunction and was taken looking toward the East, around 6 pm.